Ship Inn in Great Holland has a beer garden. The pub serves food, it has an outside area. Ship Inn serves real ale. 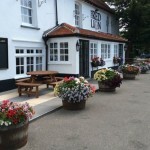 Red Lion in Kirby-le-Soken has a beer garden. The pub has a car park, it has an outside area. Red Lion serves real ale. The pub has a smoking area, it has free WiFi. Red Lion has a pool table. The pub shows football on TV, it has terrestrial TV. Red Lion is a member of Cask Marque. Ship Inn in Kirby-le-Soken shows football on TV. The pub has terrestrial TV. 18/06/2013 good food, good service, and happy staff. Frinton-on-Sea War Memorial Club in Frinton-on-Sea has a car park. The pub serves real ale, it has free WiFi. Frinton-on-Sea War Memorial Club has a dart board. The pub has a pool table, it is a member of Cask Marque.